A balanced life is key to the happiest life. But what is life balance and how can it be achieved in our fast-paced, challenging world today? The answers to these questions – and more - are what I will provide in this important article intended to help you create the most balanced (and happy) life possible. And, like with many of the other aspects of our happiness, it is most valuable to use these answers along with the many other tools and strategies provided through this website to get maximum benefit (and achieve maximum happiness). First, what is life balance? Well, it’s not trying to spend approximately equal time in your day or week between work and play. It’s much, much broader and more complicated than that. In fact, it actually has nothing to do with the amount of time you spend on any particular activity and has many more aspects to it than just work and play. It has to do with a overall sense of satisfaction and enjoyment – along with the specific rewards you receive - from many diverse areas of your life. To start defining those areas of life which would give you a sense of life balance, we need to step back to explore what each of us needs in our lives to be happy. Because, for us to really Be Happy! we each need to establish our own personal Definition of Happiness. And it’s different for everyone. Some of us include money in our definition, for example, and some of us do not. Some people need a spiritual connection with “their creator” to be happy, others do not. Many people have professional, financial, or business objectives in their definition, while others have more “lifestyle” components to their definition of happiness. In my book, BeHappy!, I devote a full chapter – the first chapter, in fact - to helping each of us create that specific definition of happiness because it is an essential start to the process of becoming as happy as possible. Interestingly, it may not be that easy for some. I know of people who have spent considerable time going through the exercises in the first chapter of the book to create their own definition. Even if that’s the case for you, it’s well worth the time and effort because it is the basis for everything else – including the creation of your life’s Happiness Plan). Since this article is about Life Balance, though, and since creating your own definition of happiness can be achieved by going through Chapter One of BeHappy!, I’m not going to repeat it in this article (although you can get a summary or primer by clicking right here … Definition of Happiness). The fact is, regardless of your own specific definition of happiness, a balance between the areas of your life within that definition – along with some fundamental aspects of life which are common to nearly everyone – is needed before any of us can be as happy as possible. For example, my own personal definition of happiness is: To pursue my mission, in a life filled with great relationships, financial freedom, and the excellent health needed to raise, and be there, for two happy, healthy, adult daughters..
(2) have great relationships, (3) create financial freedom, (4) enjoy excellent health, and (5) raise my two daughters to be happy, healthy adults (and be there for them when they become adults - they were born in 2006 and 2009). Now, let’s say that I have loads of money and am quite healthy. On a 10-point scale I might say money is at a level “9” and health is a level “8”. For this example, let’s also say that I am only moderately successful in my relationships and I am not pursuing my life's mission very well (with levels between “5” and “7”). Then, let's say I am working all the time and so I spend very little time with my two baby daughters (a level "3"). And finally, let’s assume I have had a relatively low ability to maintain a sense of inner peace and have inadequate control over my emotional response to challenging and difficult situations (levels below “4”).Under these circumstances, my life would be quite unbalanced since the things that are important to my happiness (relationships, money, health, raising my daughters etc.) are all at widely different levels of my perception of the satisfaction, enjoyment, and reward I derive from them. So even though several of these areas are “above average” in my life, I would probably not be as happy as I could be. In fact, it’s even possible I could be quite unhappy under those circumstances. Another important observation is that two of the areas listed - inner peace and emotional control - were not even part of my definition of happiness. That’s because, as I mentioned, there are some fundamental life characteristics which are common, essential features for all of us, regardless of our individual definition of happiness. As you can see, it’s quite unbalanced. While the physical and financial areas are at high levels (“8” and “9”, respectively), inner peace and emotional control are quite low (“3” and “4”, respectively). Some may say, that’s not bad since there’s nothing that’s less than a “3” and having lots of money and great health can make up for the shortfall in other areas.. Unfortunately this is not the way life balance works, however. In fact, I would probably be quite “unhappy” under these circumstances. That’s because a relatively equal level (a balance) is required in each characteristic for us to be as happy as possible – even if none of the areas is as high as an “8” or “9”. The fact is, we are generally happier overall if every important characteristic is at a level “6” or “7” than if some are at a “10” and others are at a “4” or “5”. In other words, it’s not the average - or even the highest “scores” that matter, it’s the balance between all the important areas of life for you that matters most. Yes, even though some areas of life in the lower (2nd) graph score higher than any in the first graph (there are two “10s” and two “8s” in the second), it’s generally better to have everything at the same relative level because, again, it’s the “balance” (i.e., relatively equal levels) between all important areas of your life that creates the most happiness. As you can see here, in this situation all areas of my life would be (a) relatively equal (or balanced) and (b) at a high level (i.e., an “8”, “9”, or “10”). With this type of situation, I would likely be a very happy person because (1) all criteria from my definition of happiness are represented – then some, (2) all areas are relatively balanced and (3) all scores are quite high – in the 8-10 range). With this life balance scenario there would be very little that anything or anyone could do to make me “depressed” or overall unhappy. Sure, life’s challenges, problems, and difficulties might make me sad, frustrated, or aggravated at times, but these would be relatively minor, temporary situations. 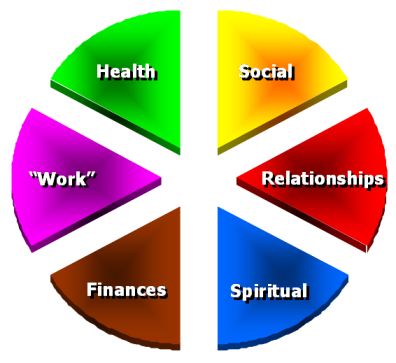 So what areas (or parts) of your life should you evaluate and monitor to maintain Life Balance? If these work for you, then use them – at least as a start. If not, you can modify them to make them more meaningful to you. 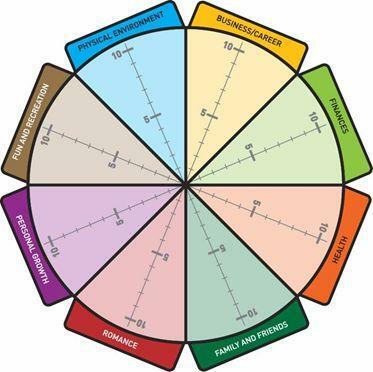 Basically, you rate the various areas of your life (relationships, finances, health, etc.) on a scale of "1" to "10". And ideally, everything should be in balance (for example, all 7's and 8's). This is much better than having some areas a "10" and others a "2". You can use either one of these wheels, but I suggest personalizing it since everyone is different - and has different areas of life which are most important. Either way, though, it is an important part of being happy. Let’s look at the three steps separately. Step One - Identify the 5-7 most important general areas of your life. These are the general categories most important to you in life as described before. Many – or even all – of them could come from your definition of happiness if you’ve completed it. Things like relationships (including family), money, business, spirituality, inner peace, health, success, peace-of-mind are all possibilities. It’s up to you. Take the time to consider the most important areas of your life – the ones you feel would lead to the greatest sense of happiness and fulfillment for you - and then pick between five (no less) and 7 (no more) to assess and monitor. Step Two - Work on the “weak areas” of your balance components: Once you have determined which areas of your life are the most important to you (the 5 to 7 areas from Step One) then take those with “scores” lower than “6” and create a plan to improve them. In the theoretical example I started with in this article, I would focus on inner peace, control of my emotions, and my spiritual connections first since these are all below a level “5” on our 10-point scale. Now, to improve in these areas, I would certainly need a strategy or plan to get there. That’s outside the scope of this article, but you can get the answers, strategies, and tools to improve your life in any area throughout this website. So use those tools as you see fit. For the purposes of this topic on life balance, therefore, the point is that you need to improve the areas that are low on the scale first – getting them to a point where they are not “dragging you down” before you focus on anything else. Once all levels are relatively balanced, you’ll start to feel better, and your ability to accelerate your happiness will be enhanced tremendously. Now, one side bar here … you might wonder, in this example, what to do about money and health – since they are already at high levels. Do I try to lower them, for example, to get them in balance with the other areas? Well, no. It would be crazy to try to get “less healthy”, for example, just to balance things better in your life. Remember, this is a process. And we can’t expect to get things perfect or ideal overnight. So even though it might be a bit better to have all areas relatively equal, there is rarely a time when we should try to take some of our high scores down to lower scores. An example of a situation where it might be better to lower a score is where you have your career or job success component to your definition of happiness and you are a workaholic – spending nearly all your effort on your work (with great success – scoring a “10” on the scale) at the expense of your relationships, your health, your ability to contribute, etc. In this case, it might be best to not focus as much on work, let the “10” slip down to a “7” or “8” and allow the other areas to get more attention and support. Again, this life balance thing can get complex – as can everything dealing with human emotion. That’s why this website is so extensive and “deep”. Everyone’s psyche is different. Everyone’s situation is different. And I want to be able to affect (help) as many people as possible. This requires an extremely diverse and comprehensive site, which I am determined to make this. Step Three - Improve all areas simultaneously: Once you have defined all the important general areas of your life (Step One) and achieved relatively equal levels of satisfaction and reward from all those levels by working on the weaker areas first (Step Two), it’s time to strive for a “10” in all areas. Again, this requires a plan, which is outside the scope of this life balance article. So, for this step, you need to use the rest of this website – potentially along with other websites, tools, courses, etc., to complete the process. If, for example, relationships is a component on your “list” of important areas to monitor in your life, go to the relationships section of this site as a start. There’s lots of information there on how to improve your relationships. And, if you need more, there are certainly other relationship-building sources for you to explore. Also, if wealth is on your list, go to the Money and Wealth section of this site to improve in that area. And so on. Develop a plan to get your graph looking something like the last one above - where all areas you have identified are in the range of 8 to 10. Once you do, you will have (a) identified the areas of your life that are most important to you (perhaps you also created your definition of happiness in the process) and (b) created a sense of satisfaction, enjoyment, and fulfillment within each of these important areas to get the greatest personal rewards from life. Doing this will certainly help you to Be Happy! You will not believe how awesome you’ll feel about yourself – and about life.